For all those adults out there who refuse to give up children’s breakfast cereal, this one’s for you! Poor Sonny the Cuckoo bird. 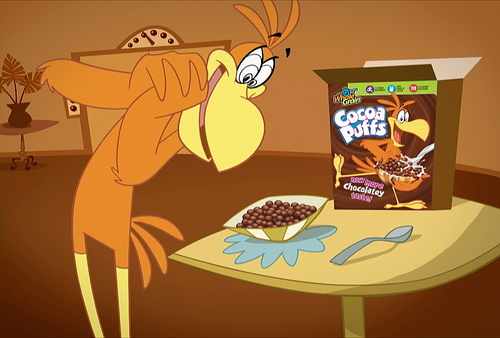 Always going crazy for Cocoa Puffs. Now, as an adult, I wouldn’t readily admit to still sneaking some children’s cereal as a treat (I do), however, this recipe gives it a twist for adults and makes it at least slightly more respectable. Yield: 1 bowl of delicious childhood memories with an adult twist. Place a cereal bowl on the table. As a treat at parties, you could also use a highball glass in place of a bowl. Add the vodka and Kahlúa to the bowl. Fill bowl with Cocoa Puffs. Sit on the couch, watch Saturday morning cartoons and enjoy! Simply put, the above recipe is a White Russian cocktail with Cocoa Puffs. The Dude would abide. If you’re anything like me, you’ll absolutely love it once the milk turns chocolatey from the cereal. Hope you enjoy it and have a great April Fools Day, everyone!